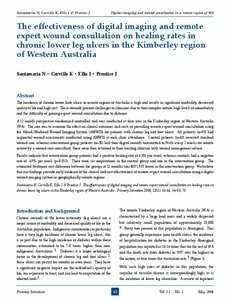 The incidence of chronic lower limb ulcers in remote regions of Australia is high and results in significant morbidity, decreased quality of life and high cost. These wounds present challenges to clinicians due to their complex nature, high levels of comorbidity and the difficulty of gaining expert wound consultation due to distance. A 12 month prospective randomised controlled trial was conducted at four sites in the Kimberley region of Western Australia (WA). The aim was to examine the effect on clinical outcomes and costs of providing remote expert wound consultation using the Alfred/Medseed Wound Imaging System (AMWIS) for patients with chronic leg and foot ulcers. All patients (n=93) had sequential wound assessments conducted using AMWIS at each clinic attendance. Control patients (n=43) received standard wound care, whereas intervention group patients (n=50) had their digital records transmitted to Perth every 2 weeks for remote review by a wound care consultant; these were then returned to their treating clinician with wound management advice. Results indicate that intervention group patients had a positive healing rate of 6.8% per week, whereas controls had a negative rate of -4.9% per week (p=0.012). There were six amputations in the control group and one in the intervention group. The estimated treatment cost difference between the groups at 12 months was $191,935 lower in the intervention group. We believe that our findings provide early evidence of the clinical and cost effectiveness of remote expert wound consultation using a digital wound imaging system in geographically remote regions.